Welcome to cement tile Tuesday. We have a tradition here at Granada Tile for naming our cement tiles after the places that they bring to our mind. 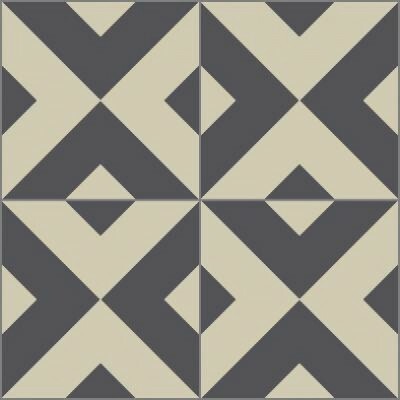 When we saw the intriguing design of this concrete tile, with its dynamic triangular pattern and its light and dark stripes, it evoked memories of a movie we’d seen in IMAX with its herd of zebras galloping across the vast plains of the Serengeti. The flash of stripes, the energetic charge of the animals as they ran across the desert: we felt that the pattern of this tile conveyed that same vitality. 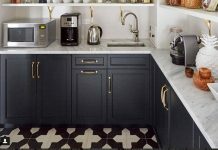 In black and cream, our standard colorway, these cement tiles brings to mind the colors of African mudcloth; in black and white, as in the home of Fall Out Boy’s guitarist, the concrete tiles takes on a more graphic twist. 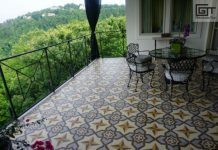 You can also order these cement tiles in color combinations suitable for your home or restaurant’s design and decor. …but you can really get a sense of its dynamism when it’s laid out, as it is here, on a side wall. Here, with one right angle green, the result is striking but much more classic, reminiscent of a pattern from the 30s. The qualities that make Granada Tile’s cement tiles perfect for a hardworking coffee shop or restaurant space — in addition to their beautiful designs and vivid colors, our concrete tiles are long lasting, easy care and low maintenance — are the same ones make it perfect for your home, whether used as floor tile or wall tile. 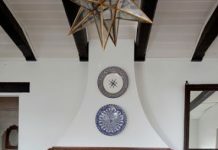 Start by visiting our web store to peruse our large selection of in-stock handmade master-crafted cement tiles and call us today at 213-482-8070 to discuss which of our encaustic tile designs would be perfect for your home or restaurant project.